I have a full-time career (in addition to Spoiled Pretty) and I’m also a new mom, which means that I’m short on spare time – especially in the morning. Before I had Westley, I used to take my time and carefully apply my makeup before heading off to work. Now I’m so busy that I’ve had to seriously streamline my morning routine. On days when I’m in a rush, but need to look pulled together and polished, I even out my skin with foundation, then apply a skincare product that contains Vitamin E oil. During the winter, when I’m abnormally dry, I pat Elizabeth Arden’s Ceramide Gold Ultra Restorative Capsules Intensive Treatment for Face and Throat on top of my foundation, all over my face for a dreamily dewy glow. It imparts a healthy radiance while protecting my skin from environmental stress and working its anti-aging magic. Now that it’s summertime, my skin is on oil overload – so, instead of applying it all over my face, I’ve been using the serum just on the bridge of my nose, my cheekbones and brows – to highlight my bone structure. Hyperpigmentation is also a major skin issue for me, and I’ve found vitamin E to be particularly effective at diminishing my dark marks and acne scars – so this product is great for that too. Just remember to also use sunscreen so that the dark spots don’t re-appear! 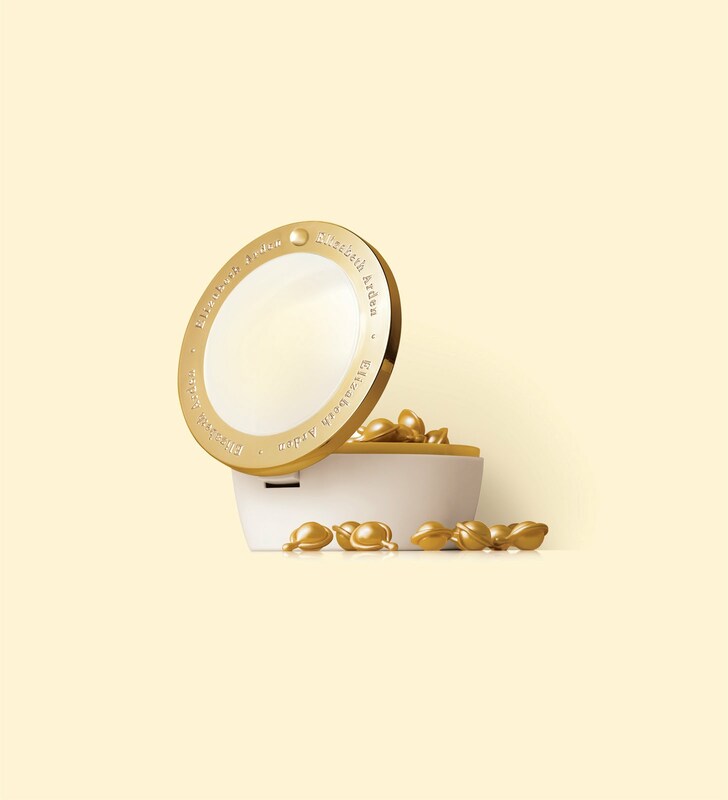 The Ceramide Gold Ultra Restorative Capsules have so many benefits that they’re well worth the $68 price of admission. Plus the container looks so pretty on your vanity. Just be sure to warn your sweet tooth of a spouse to look but NOT touch…Mr. Spoiled Pretty almost ate one of the capsules, thinking it was candy!